A gun-wielding robber, Gbenga Babatunde, 25, arrested by operatives of Rapid Response Squad (RRS) of the Lagos State Police Command, has confessed to have robbed about 35 ATM users in Alaba-Rago Market, Ojo area of Lagos before his arrest. The suspected robber, who was arrested after a failed bid to rob a lady who withdrew an unspecified amount of money around 5:48 a.m. at an ATM point in Alaba-Rago Market, was chased by the operatives patrolling the area, during which a cut-to-size locally made short gun with two life cartridges were recovered from him. It was gathered that the suspect, was not operating alone. He had an accomplice, whose name was given as Samson Baba Ramadan, 28, but managed to escape after the botched operation. 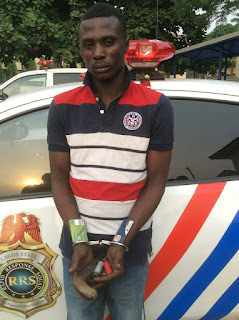 Upon his arrival at the RRS's Headquarters in Alausa, the suspect who owned up to the crime, said that his accomplice, now at large, introduced the criminal act to him. “I have been in the crime since I met my colleague, Samson Baba Ramadan. I met him at Field Joint, Alaba, two years ago and since then we have been working together…. We have robbed about 35 people together. We would have gotten to the ATM point by 4:00 a.m. We would hide inside the shop that is not open beside the ATM point…. As soon as the withdrawer collects the money, we will accost him or her and collect the money and escape. The last money we collected was N40,000. Yesterday, we collected N12, 500." In his words, “this morning, we wanted to collect money from a lady. That lady ran away. We thought she had gone, not knowing that she went to inform RRS. This was around 5:00 a.m. They pursued us and arrested me but my partner escaped. I don’t go home. I sleep in Osankwa Hotel, Alaba Rago. It is only whenever I don’t have money that I go home. I have no wife and no child”. 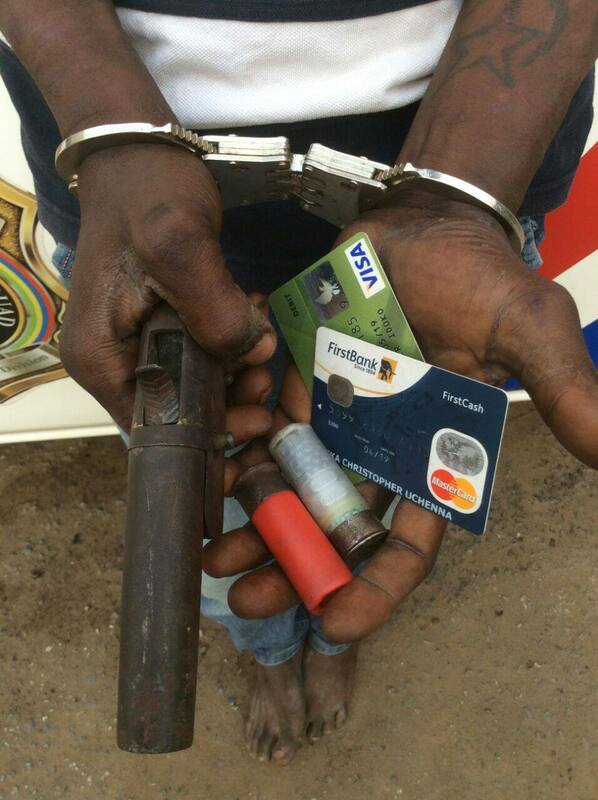 Also recovered from the suspect were: a First Bank MasterCard belonging to Iweka Christopher Uchenna and a Diamond Bank debit card owned by Nkechi Esther Idoko. The State Police’ Spokesperson, Superintendent of Police, SP Dolapo Badmus, who confirmed the arrest, noted that the State Command would leave no stone unturned towards ensuring that suspected criminals are brought to justice. The case has been transferred to State Criminal Investigation Department (SCID), for further investigation and prosecution.